"These efforts resulted in the Opus 21 s30 based on the DNM PA3 series of amplifiers. The PA3 is one of the finest sounding solid-state amplifiers ever produced. The design is somewhat deceptive - the schematics appear highly conventional but there are details which transform the performance. Most important is the treatment of the amplifier as a network element and the careful tuning of ultrasonic frequencies. How the amplifier handles signals beyond the audible range is more important than believed. This is not your everyday solid-state amplifier. This approach requires a sophisticated combination of measurements and listening tests that result in a highly tuned circuit. Surprisingly, these modifications are not detectable with conventional audio amplifier measurements, which are typically limited to audio frequencies. This area of research may explain much of the sonic differences among amplifiers which have similar measured performance [ from the Resolution Audio website]." errors with the audible range are another core concern. Related are realistic rather than overkill power ratings. Current DNM designs combine surface-mount technologies with old-fashioned hand labor, the latter of the vaunted Swiss kind whereby Reson of Switzerland is licensed and contracted to build DNM's designs. 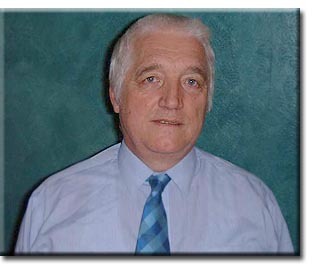 DNM's company philosophy is also very green by insisting on protecting customer investments; building for extreme reliability; and offering fully reconditioned second-hand DNM equipment which creates a growing community of DNM owners who can comfortably trade in equipment to upgrade while newbies may enter ownership with cost-effective recycled refurbs. The modular building approach further allows ready upgrade conversions which are priced attractively to insure a less than 5% depreciation of the customer's original brand investment. Even the currently en vogue cable movement to low-mass connectors and simple geometries has long been a DNM mainstay and the Eichmann approach borrows much from their work. Morecroft's very affordable interconnects and speaker cables are in fact the stuff of legend. 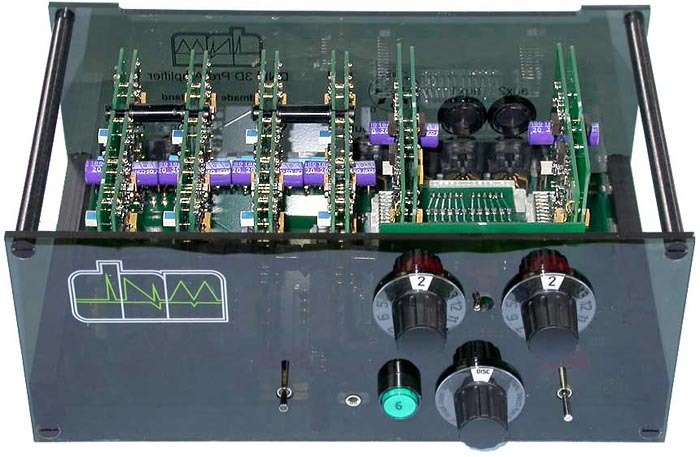 While the mention of DIN plugs could raise the old incompatibility specter of early Naim kit which didn't interface well or at all with off-brand gear, Morecroft assures us that this is not at all the case with DNM. 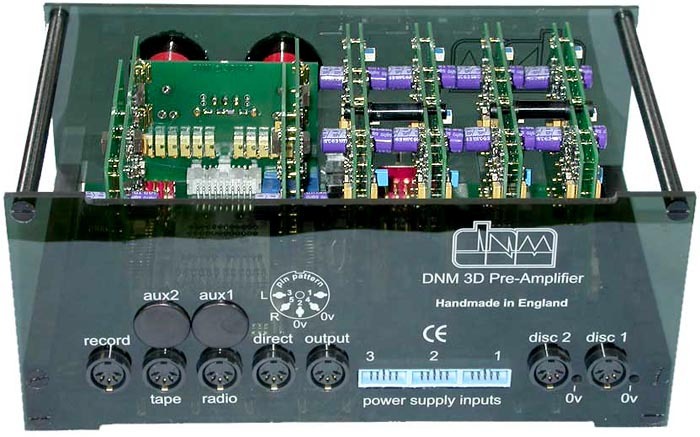 DNM's preamp is called 3D and the Primus, Twin or Six power supply options determine whether the final two-box affair becomes a 3D Primus, 3D Twin or 3D Six preamp. 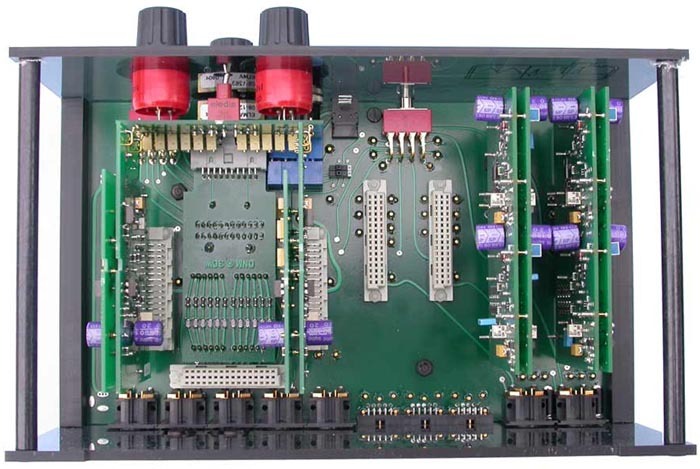 For placement options and cable length management, an optional signal transfer board allows an amp to derive its inputs from the preamp's power supply rather than its main chassis. DNM uses the 5-pin DIN interface to carry left/right grounds discretely and low capacitance/high inductance interconnects are a must for best results. The split or dual mono volume control can be set to output a mono signal. The headphone socket is driven directly from discrete line amplifiers and suitable for 35 - 300+ ohm loads. For best performance during headphone listening, the power amp interconnect should be disconnected to override the main-out muting feature that gets otherwise engaged but apparently compromises the headphone signal somewhat. It is also recommended to disable any unused source inputs by setting their corresponding toggle selectors to off. 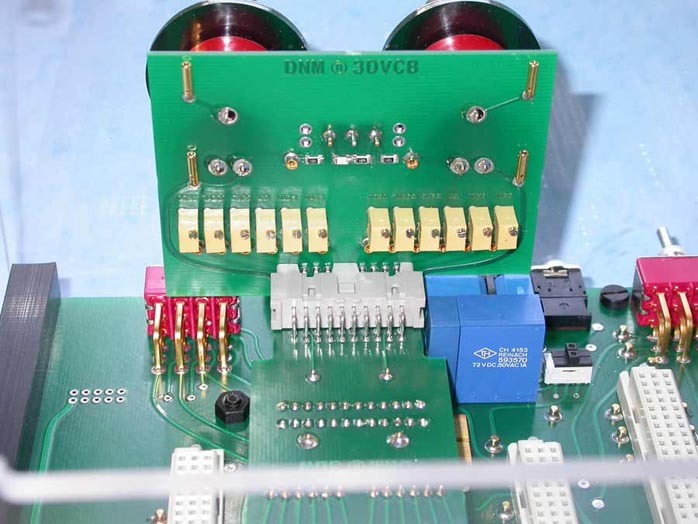 When both optional RIAA boards are fitted, the 3D selects between either cartridge feed (any combination of moving coil/magnet is possible). DNM's singular obsession with extreme wide-band circuit tuning has, as summed up by Roy Gregory of HiFi+ in his 1999 assessment of DNM's PA3S power amps, resulted in something "fussy eclectic and off-beat. Resolutely hair-shirt, two channel and devoid of any convenience features at all, they are expensive and in terms of material content, sadly lacking. They are also beautifully made precision amplifiers, rather than male jewelry or foundation stones for your ego. They should be measured on the scales of musical satisfaction, and in that realm they're one approach to the state of the art." In other words, forget audio jewelry, Boulder/Rowland-type tank construction, remote control and sundry creature comforts. This is uncompromising kit that doesn't romance the typical hifi punter with the usual laundry list of attributes many equate with quality - size, mass and glitz. Incidentally, Morecroft is quick to credit superior SETs with especially treble performance and purity that is far harder to achieve with transistors. Still, his expertise with semi-conductors and associated research convinces him that if properly applied, transistor circuits have the upper hand. It's that elusive if that separates the men from the boys and includes minutiae like acrylic screws and the wonky behavior of subtle electromagnetic fields which set up counterparts to oppose the originals while invoking an audible electronic haze or congestion. Removal thereof -- what we might call a pervasive electronic signature that distinguishes playback from live performance -- has been Denis Morecroft's private crusade. It's arguably been running in parallel to the SET renaissance which is based on similar pursuits, albeit based on different technical implementations. Stereophile's Art Dudley, a listener after my own SET/hi-eff speaker heart, had more than one go-around with DNM gear over the years. His latest one published in 2005 where he concluded that "...toward the end of the year, the 3C Primus was at the heart of a system that gave me more pleasure than any other: an all-Linn record player driving the DNM preamp, driving the Lamm monoblocks, driving the Quad ESL-989s: the best combination of musical accuracy, color, drama, scale, and texture I've ever enjoyed in my home, framed with superb stereo imaging - and all quite fun to use. The DNM once again impressed me as extraordinary in virtually every sense - and more than worth the asking price." Art then mused that "the Primus is only the entry-level 3C preamp: The others in the line, especially the new 3D, may well sound even better. And I'm told the 3D does have a mono switch." His surprised and surprising assurances to readers that the entry-level DNM preamp positively loved SET amps naturally didn't go unnoticed here. When an overture for a DNM review was made, first with us, then with DNM on our behalf and the company responded to that reader's suggestion by contacting us, I welcomed the opportunity. As subject, the new 3D preamp was proposed and I happily agreed. If its predecessor had lifted Dudley's kilt so flamboyantly, what fine things could the new 'um be accused of?